Christopher Chagnon was born February 19, 1951, in Bad Axe, Michigan. Formerly the team photographer for the Detroit Tigers, and now a full-time writer, he has written two best selling novels, The Dregs of Presque Isle and The Ghosts of Presque. The Soldiers of Presque Isle is book three of The Chandlerville Chronicles trilogy. 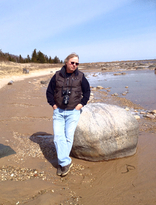 He is an award-winning short story writer and photographer living with Nannette, his wife of forty-five years, in Presque Isle County, near Onaway, Michigan. He manages time to hunt, fish, and play guitar or drums in a rock and roll band when he is not working on a new writing project.